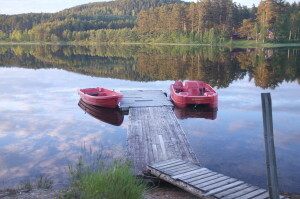 Kilefjorden camping is directly located next to the Otra River, which is loaded with fish. It is possible to fish from the shore, but you can also rent a rowboat. 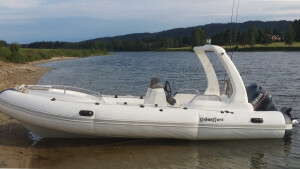 For fishing the boat offers space up to 4 persons, but the RIB has space for a maximum of 10 persons. Just ask for the options. From its location on the bank of the Otra River, you can fish for trout, perch and “bleka”. Bleka is is a dwarf salmon which is related to the Atlantic salmon family. This fish got trapped in inland waters as the landmass rose after the last ice age 10,000 years ago, and a local variant subsequently developed. After a six-year project during which 20 tons of small fish were removed from the water, the quality and size of the river fish has improved immensely. In 2001, a trout weighing 2 ½ lbs. (1,2 kilograms) was caught using a rod. Trout weighing over 1 lb. (0,5 kilogram) are caught regularly every week. Fishing permits and fishing equipment can be bought at the camp shop. We also have boats and canoes for rent.